I'm not a ‘size 8 with skimpy shorts and a 6-pack’ kinda girl… In fact I’m a curvy lass of size 18. And, shocking as it may seem to popular social media, I do my yoga and I love it :-) But, I also struggle with maintaining a regular practice and I sure as heaven ain’t going to be standing on my head anytime soon! Real yoga is about real people living real lives… We’re not gym bunnies, we love an occasional hot chocolate (with whipped cream). We work hard every day to save for package holidays and prefer a cosy night in with the girls rather than a night out at the club. We’d also love to do yoga, meditate, cook plant based food, save the oceans and knit every day… but to be frank - we simply don’t have the time. Yup - it’s time to get REAL. So much of yoga in the media showcases beautiful people; ex-gymnasts and super-flexible dancers, doing some kind of extreme contortions that resemble yoga poses whilst balanced on one hand (on top of a very uncomfortable looking rock) at sunset. And then, these exceptional feats of daring are expertly captured by professional photographers and splashed around the web as the pinnacle of yogic perfection. But what about yoga in the real world? The icky worm wriggling between your toes when you do bare-foot yoga (it really did seem a good idea at the time). The sand in your knickers when you’ve attempted a bridge pose in the kid’s sandpit. Not to mention the bobble hats and leg warmers in the draughty living room… And then there’s the ‘cat-food-encrusted’ kitchen yoga and of course the ‘toilet-seat-meditation’ at work… Yes - yoga is most definitely about you and and how it fits (or not) into your every day, very real, life. Did you know that a consistent 10 minutes of yoga a day is actually one of the best ways to get great results? Research shows that you can reduce anxiety, get a better quality of sleep and reduce back pain and much much more in as little as 10 mins of yoga a day! But, we all know from experience that keeping motivated to do ANYTHING, even for 10 mins a day, requires a lot of willpower and a hefty sprinkle of Fairy Godmother support. So, if you’re gonna do this yoga thing, you’re going to need to access yoga whenever and wherever you want it… Cue the Online Studio! 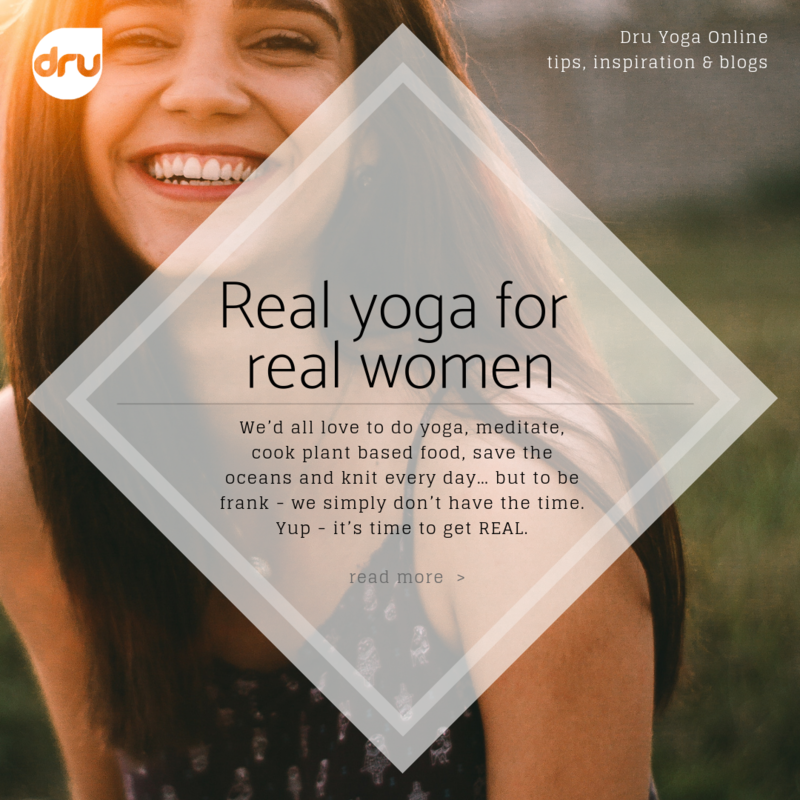 The Dru Yoga Online Studio has been around for over 9 years and that, in internet terms, is quite simply, ancient. We were the first people to provide online yoga here in the UK to serve the thousands upon thousands of people who love real yoga for real people. 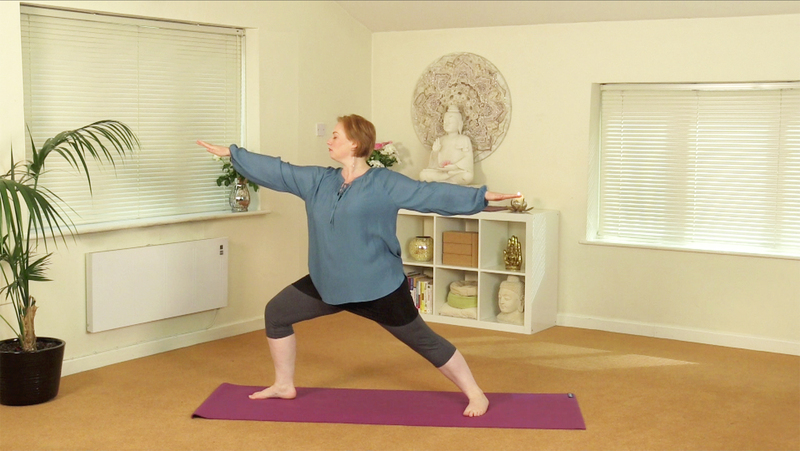 With short classes, long classes, relaxations, mediations and inspiration, the Studio is a hub of fabulous content by even more fabulous tutors. You can choose to be strong and dynamic or gentle and calming. You can explore empowering affirmations, discover pranayama and even meditate whilst you’re on your commute. AND we’ve got a great tribe of like-minded people to help you along when you need that little bit of extra moral support. In a nutshell - it’s perfect for real women living real lives - basically - it’s perfect for you! Love your honesty here Anouschka. I do get tired of all the thin lithe heavily made up young women doing poses that are unattainable for most of us. Part of why I love Dru actually that it’s so accessible and inclusive of all body shapes, ages, abilities and lifestyles!